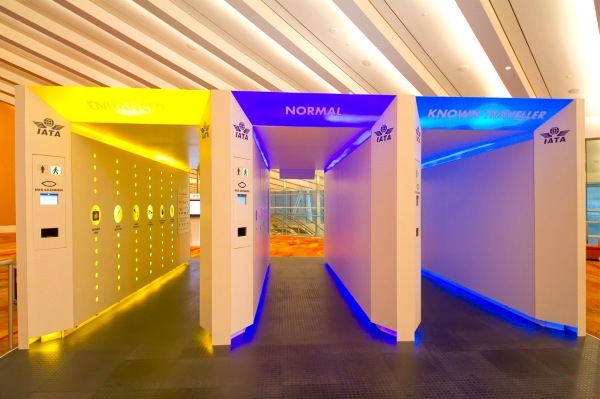 Is this the checkpoint of the future? IATA’s annual conference in Singapore unveiled this new three, 20-foot long detectors. A new airport security prototype that promises to move away from a system that looks for bad objects, to one that can find bad people. The three detectors – one for “known travelers”, one for high-risk flyers, and one for everyone else – will be using eye scanners and biometric chips to verify the passengers identities and analyze their personal history, before dividing them into groups. People who complete and pass government background checks would walk through the fast-pass lane with their carry-on luggage in tow, whereas those deemed particularly risky would have to undergo a more intensive, full-body scan within the “Enhanced” security lane. The rest of us, meanwhile, would be directed to the “Normal” detector, which would automatically scan us for liquids, metals and everything that is evil. The IATA says this risk-based approach would reduce security lines and lower airport costs, but it would still require governments to share data on their own citizens, which could pose a major hurdle to widespread adoption. For now, the IATA and governmental agencies are still hammering away at the details and have yet to announce a pilot program, but check out this video demo (no audio). Will this increase or decrease the airfare? We don’t know yet. But this is exciting!